Every day, Parley gets messages from people around the world who are taking action for oceans. You’re eating less (or no) seafood, banishing plastic from your daily routine, raising awareness and even designing new products that don’t harm the oceans. Together, we’re helping create change – but if we’re going to save our oceans we need to inspire a worldwide movement and reach people who don’t yet know about the problems, and the solutions. Our ongoing work with adidas is a huge part of that plan. Sport unites fans and brings millions of people together on a global level, so our collaborations across soccer, football, tennis and now hockey take the message to a new audience, putting the oceans on the field, the court – and the ice. Unveiled this week, the new special edition adizero Authentic Pro x Parley jerseys will be worn by the NHL's best players exclusively for the 2019 SAP NHL All-Star Skills™ and the 2019 Honda NHL® All-Star Game on Saturday, January 26 at SAP Center in San Jose, California – fittingly, home of the San Jose Sharks. A limited number are also available to purchase from the adidas and NHL shops. 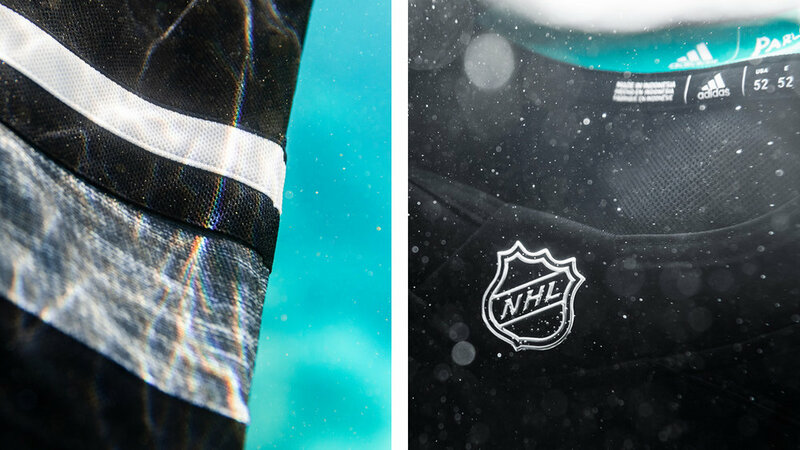 The first-ever NHL hockey jerseys featuring repurposed and upcycled materials, the limited-edition series is created with Parley Ocean Plastic® – a premium material created from recycled waste, intercepted from beaches and coastal communities before it reaches the ocean. Each jersey is crafted to be a symbol of change in the movement to protect the seas. As a part of a partnership and joint commitment to end marine plastic pollution through the Parley AIR Strategy (Avoid, Intercept, Redesign), we rework these various marine plastic waste materials into technical fibers that create the material framework of a durable, yet breathable fabric that is optimal for adidas performance apparel.